Israel's education ministry is to drop from an Arabic language textbook a term describing the creation of the state of Israel as "the catastrophe". The Arabic word "nakba" has been used with Israeli-Arab pupils since 2007. It does not appear in Hebrew textbooks. Education Minister Gideon Saar said no state could be expected to portray its own foundation as a catastrophe. Israeli Arab MP Hana Sweid called the move an attack on Palestinian identity and collective memory. The passage in question, which occurs in one textbook aimed at Arab children aged eight or nine, describes the 1948 war, which followed Israel's creation, in the following terms: "The Arabs call the war the Nakba - a war of catastrophe, loss and humiliation - and the Jews call it the Independence War." The sentence was introduced when Yuli Tamir of the centre-left Labour party was education minister. Ms Tamir's successor in Benjamin Netanyahu's right-wing administration, Mr Saar, said: "There is no reason that the official curriculum of the state of Israel should present the establishment of the state as a 'holocaust' or 'catastrophe'." Mr Saar added that state education for children was not supposed entail the de-legitimising of that state. "Including the term in the official curriculum of the Arab sector was a mistake, a mistake that will not repeat itself in the new curriculum, which is currently being revised," he concluded. Correspondents say most Hebrew-language history books, especially when written for schoolchildren, focus on the heroism of Israeli forces in 1948 and gloss over the mass exile of Palestinians. If it is mentioned at all it is attributed to a voluntary flight, rather than the deliberate expulsion which later revisionist historians have uncovered from archive sources. 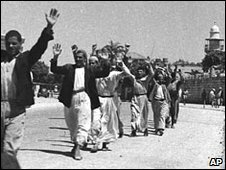 The term Nakba is usually applied to the loss suffered by millions of Palestinian refugees displaced by the 1948 war and subsequent conflicts; their fate remains a key factor in the Israeli-Palestinian dispute. Jafar Farrah, director of Israeli-Arab advocacy group Moussawa, told the BBC that removing the word Nakba from textbooks would not stop Arabs from using it, but it would complicate relations. Far-right members of the Israeli government are pursuing legislation to make it illegal in Israel to commemorate the Nakba, as Palestinians and their supporters do every 15 May.